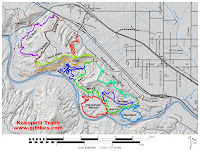 The Mary's Loop trail is part of the Kokopelli Trails system just south of Interstate 70 between Loma and Mack. 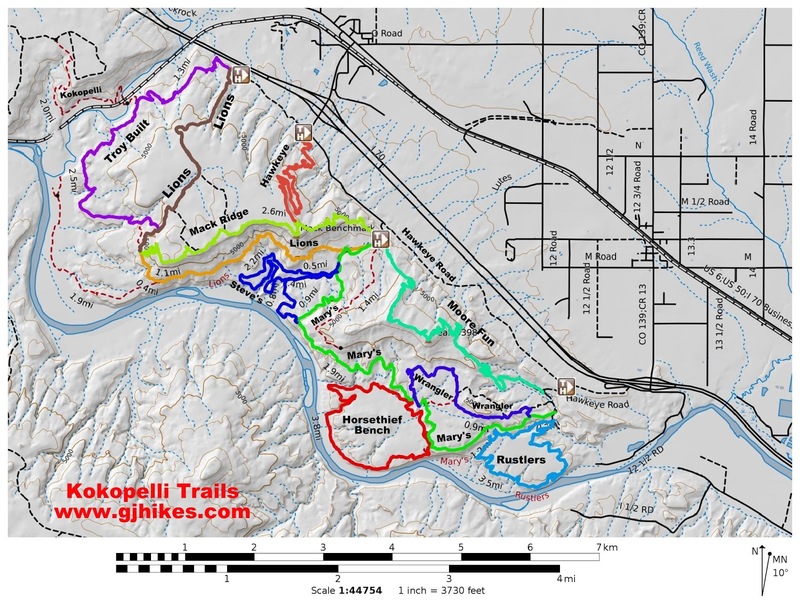 The Kokopelli Trails are some of the most popular mountain bike trails in western Colorado. To access the Mary's Loop trail you can park at the Kokopelli Trailhead and follow the road over the hill or you may be able to find a spot open at either the Moore Fun parking area or the Rustlers Loop trailhead. I parked at the Moore Fun area and began from there. From the Moore Fun parking area I followed the trail that runs beside the road for a couple hundred yards to where Mary's Loop begins. The trail climbs up the hill for the first half mile. The first quarter mile is probably the steepest but it isn't too bad at all. Mary's Loop follows along the bench above Rustlers Loop for about a mile. The trail base varies between packed red dirt intermixed with some rocky stretches. Mary's Loop parallels the Colorado River for the first 4.5 miles. Across the river are good views of the Black Ridge Canyons Wilderness Area. You can see West Pollock Canyon, Rattlesnake Canyon and Bull Canyon directly across the river. If you know where to look you can even pick out Window Rock Tower high above West Pollock Canyon. I passed the turnoff for the Horsethief Bench Loop at about 1.7 miles, the Marys Cutoff, that runs over to Wranglers Loop, at about 2.05 miles and the upper turnoff for Wranglers Loop at about 2.3 miles. For the next mile Mary's Loop continued to skirt the bench above the Horsethief Bench Loop. Once the trail passed the Horsethief Bench Loop area it began getting a lot more technical for the bikers. A few spots looked like they would be downright exhilarating. For hikers and trail runners the trail was no problem at all. Of course, some of the guys on bikes blew through the area like it was another day in the park. I passed through a gate at about 3.35 miles. From here the trail had sections that ran up and around the hills. A few stretches of the trail were narrow and right along the edge of the cliff. The bikers were passing by as though they had ridden the trail a hundred times. I came upon the cutoff for Steve's Loop around 4.25 miles. Most of the bikers were leaving Mary's Loop at this point and some had already turned around and headed back the other way. From here the trail left the Colorado River behind and turned northward towards Mack Ridge and the interstate. Mary's Loop was now traveling along an old 4-wheel drive road. I came upon the main junction of the Steve's Loop trail at about 5.15 miles and just a little further and I was at the Lions Loop intersection. From here it was about a half mile up the hill to the Mack Ridge trailhead. And here is where the Mary's Loop trail ends. I was standing in the parking lot at Mack Ridge and I was still 5-6 miles from where I parked depending on which way I would decide to go. Like several of the other trails Mary's Loop isn't a complete loop in and of itself. You have to add another trail or make use of the gravel road to get back to where you began. I say that because if you look up Mary's Loop somewhere and get the idea that you are going to have a 6 mile jaunt you might be unprepared for the whole adventure. Anyway, Mary's Loop was a great hike and it seemed to be one of the most popular trails with the bikers. I will probably come back and ride it myself sometime. As fun as it was I think that I'm up for some more fun so I'm going to take the Moore Fun trail back to my truck. If you want to check out Mary's Loop it is a great place to 'Take a hike'.